By the middle of May, the hydro system was working as planned, beginning to fill reservoirs with runoff from the region's huge snowpack, while mainstem Columbia flows were being managed about a half-foot below flood stage at Vancouver. By June 1, flows were a foot above flood stage, but still under control. Flows at Bonneville Dam were hitting 450 kcfs by May 15. Nearly half that was pouring over the spillway, and more water was expected, but luckily, the threat of a major storm hitting by the weekend dissipated by May 18, when dam operators and fish managers met in Portland to discuss the coming week's operations. They were also dealing with a rumor that the Columbia Basin's water supply was still increasing. But at that time, the official update was still a day away. At Montana's Libby Dam, plans were under way to use some spill to release an extra slug of water into the Kootenai River to help ESA-listed sturgeon for spawning and egg incubation, but flows were increasing fast. The Corps is expecting inflows behind Libby to reach 139 percent of average this year. According to a May 16 system operation request, flood control operations may supersede sturgeon augmentation operations, which called for a 1.2-MAF pulse to aid the fish. "In such a scenario," said the SOR, "Kootenai River stages may be at or near flood stage, prior to sturgeon operations, rendering spill unfeasible or undesirable." The reservoir is slated for refill by the end of July. At Hungry Horse, inflows reached the mid-25 kcfs range, while outflows were about 8 kcfs. The reservoir was expected to refill by the end of June. Inflows into Lake Pend Oreille behind Albeni Falls Dam spiked to 100 kcfs from around 40 kcfs, with about 63 kcfs going out in freeflow. The situation was slated to stay that way until the lake fills, sometime in June. Snowpack levels upstream of Lake Pend Oreille ranged from 152 percent of normal in the Upper Clark Fork Basin to 182 percent in the Flathead Basin. Some local flooding was expected. At Idaho's Dworshak Dam, refill was beginning with more than 25 kcfs coming into the reservoir, and 2.5 kcfs going out. Managers said it was expected to be full by the end of June. Inflows at Grand Coulee were around 225 kcfs, with outflows in the 160-kcfs range. Flood control elevation bottomed out the week before and had risen about five feet to 1,220.2 feet by May 18. Flood control mandates a call for the reservoir to fill by July 1 to a level of 1,290 feet. On the lower Snake, flows hit 200 kcfs at Lower Granite Dam, with plenty of involuntary spill. All transportation activities were stopped temporarily there and at Lower Monumental, which also put a halt to the Corps' juvenile barging program. Dissolved gas levels at most lower Snake dams were above allowable state waivers, but little evidence of trauma in juvenile salmonids had been observed in the smolt monitoring program. TDG levels were running 5-6 percent above the 120-percent limit at lower mainstem dam tailraces, while forebay limits of 115 percent were generally maintained. 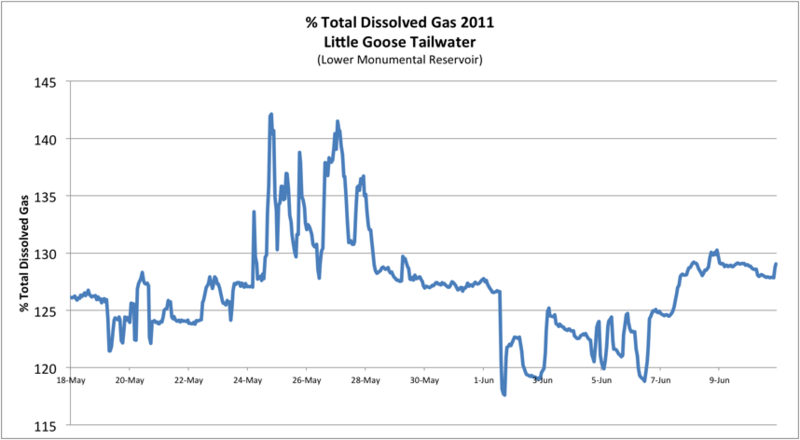 Smolt monitoring at the dams showed little evidence of gas bubble trauma. On May 17, only one fish out of a 100-fish sample showed symptoms of GBT at Bonneville Dam. On May 19, the rumor about more water proved to be true. The water supply had jumped again, to 127 percent of average from 121 percent at The Dalles (April-September), according to the latest forecast from NOAA's Northwest River Forecast Center. Up on the Snake, Brownlee Reservoir inflows from April-September jumped 11 percent to 137 percent of average. The Columbia's seventh-highest water supply year just jumped two more spots to fifth highest in the last 41-year record, with the April-September volume pegged at 125 MAF. With average basin snowpacks usually in full retreat by now, the early May snows had generated some pretty goofy numbers at measuring sites. Take the Quartz Peak SNOTEL site (elevation 4,700 ft.) on the Washington-Idaho border; it was reading 475 percent of average snowpack. At the May 25 TMT meeting, the Corps reported that the powerhouse at Little Goose Dam on the lower Snake had to shut down after a transformer malfunction affected four units and grounding problems led to two others being shut down. That meant the entire Lower Snake was sent over the dam's spillway except for a small flow to maintain station service. Repairs were expected to be completed between the following Friday and Monday. The main adult fish ladder had to close when the powerhouse was shut down, but spring chinook still seemed to be finding other entrances to the adult passage system. No major delay in their passing was evident, but the fish were swimming through the tailrace where the added spill from the shutdown had boosted TDG levels to 134 percent. Corps spokesman Steve Barton said flows in the 220-kcfs range were expected in the lower Snake later in the week. In addition, on May 24, the Corps began repair work on a gearbox in the lock-gate mechanism at The Dalles Dam, bringing a halt to all barge transportation on the Columbia and Snake rivers, including the smolt transportation program. The Corps expected it would take four days to complete the repair. They said if the Little Goose repairs were finished before the navigation lock was fixed at The Dalles, they could transport fish to the forebay at The Dalles and release them there, but fish managers from Idaho and Oregon were not receptive to that scenario. ODFW representative Ron Boyce contended that inriver spring chinook had shown some of their highest return rates ever under high flows and uncontrolled spills, "so having fish migrate inriver is not a bad thing." Boyce didn't cite any specific data to back up his point. He later told NW Fishletter that he thought it was from the early 1980s, but he had to check. Actually, there were no smolt-to-adult survival studies completed during that time frame. But the powerhouse at Little Goose was still offline on the morning of June 1, when the TMT met again. The Corps said barging had recommenced at other lower Snake collector dams, but the high spill rate at Little Goose kept barges from tying up there. They expected the turbines to be up and running by then, after repairing a relay system that kept tripping when they had tried to power up the dam, after fixing a transformer. The project finally went online later that afternoon. By June 1, inflows at Coulee had risen to 260 kcfs, and outflows were boosted to nearly the same levels. Elevation had reached 1235 feet by then. The high level of spill helped raise gas levels to 143 percent, which affected the river all the way downriver to Rock Island Dam (see Story 2), where 37 percent of the smolts monitored there showed sign of gas bubble disease. Meanwhile, on the Snake, where the Little Goose spillway was still running hard, about 23 percent of the smolts examined at the next dam downstream showed evidence of gas bubble disease. Luckily, most juvenile spring chinook were well downstream by now, while numbers of subyearling fall chinook slowly increased. On June 1, flows at Bonneville Dam rose just above 500 kcfs, and were running nearly that hard all the way downriver from McNary Dam. The latest water supply forecast appeared June 2, and moved the 2011 water supply up another notch as the fourth highest in over four decades, at 133 percent above normal at The Dalles for the April-Sept. time frame (131 MAF). Precipitation in May was more than 150 percent of average. Continuing below-average temperatures kept snow falling above 4,000 feet in many Northwest basins. There was still plenty of snow to melt. Officials said 75 percent of the runoff remained above Libby Reservoir in Montana. Flows were expected to rise again in the Snake as well. By June 1, . . . Meanwhile, on the Snake, where the Little Goose spillway was still running hard, about 23 percent of the smolts examined at the next dam downstream showed evidence of gas bubble disease. Luckily, most juvenile spring chinook were well downstream by now, while numbers of subyearling fall chinook slowly increased. 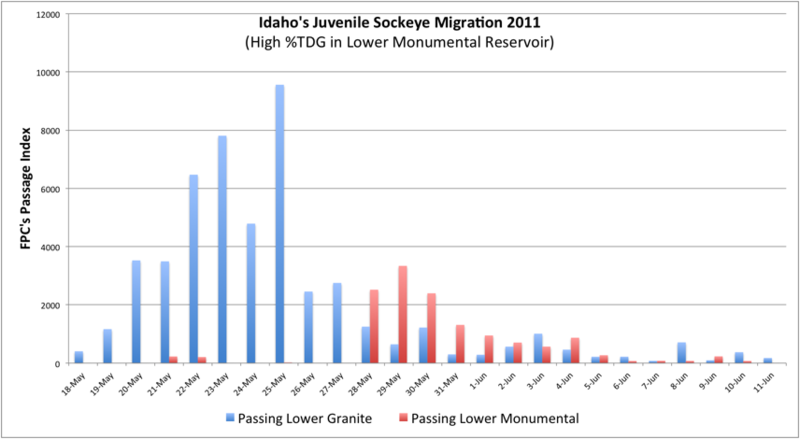 I would like to point out that the vast majority of Idaho's Sockeye Salmon were in the very high Total Dissolved Gas waters of the Lower Snake during the Little Goose transformer outage. On May 28, fish monitoring at Lower Monumental Dam found nearly one quarter of fish displaying signs of Gas Bubble Trauma. With this in mind, a correction or update of your story seems warranted as this certainly was not a "Luckily" circumstance for Idaho's endangered Sockeye. Select Project Site: Lower Monumental or Lower Granite.